Wow – it’s tough rating films when moving from an emotional silent film about war to a light-hearted musical about life on Broadway. I’m trying to place The Broadway Melody into the proper context of its genre and place in movie making history. I am aware it is the first “talking picture” to win an Oscar and a musical to boot. Once again, I enjoyed the glimpse into history and the street scenes of New York City in 1929 were amazing. The story of two sisters trying to break into showbiz seems rather pedestrian but maybe in its era it was a fresher story. There were a number of good musical scenes especially if you like good tap dancing and surprisingly elaborate costuming. I was familiar with maybe two songs and in general am not a big fan of songs from musicals pre-1940 (at least I don’t think so – maybe this will change). I do enjoy musicals and as much as I may try to critique The Broadway Melody like a moviegoer from the 1920’s, it’s difficult to forget 80+ years of newer musical productions. I’m not sure why the technical production of Wings (1927) appears superior, but The Broadway Melody may just lack newer remastering. In our current era of political correctness, some of the dialogue was actually alarming. Comments made in the film about women and people of various nationalities clearly reflect the thinking of a bygone time (at least I hope so); nevertheless, the repartee is interesting from a historical prospective. The wise crack about Scottish people completely baffled Elliot – that’s a good thing! This movie will not be a favorite but I’m glad I watched it. 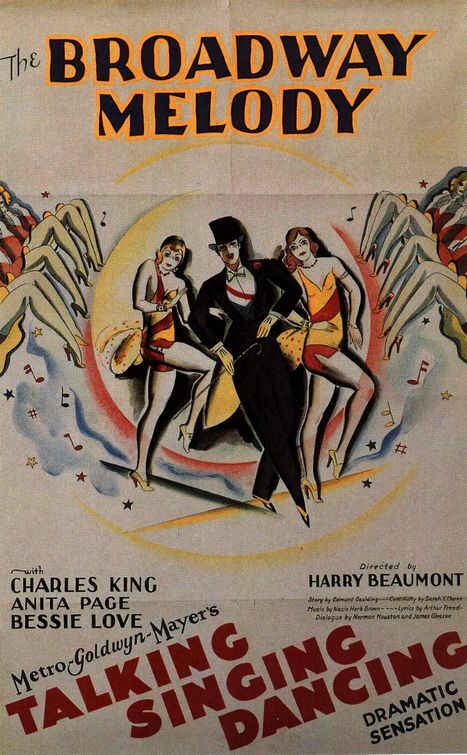 1929’s The Broadway Melody, definitely fell into a sophomore slump in the larger context of the progression of Best Picture winners. While I understand there were certain technological limitations in the transition between silent film and sound, this first sound winner fell flat. It is hard to ignore the lack of ambient sound in places where there is no dialogue or singing or dance numbers, and it seemed as though the cinematography suffered dramatically in an attempt to cater to this new technology of sound. Let’s be clear however, I am not a musical naysayer. In fact, I rather enjoy musicals. However, the brand of musicals made in the 1920’s lacked the warmth and depth of the pioneering Rodgers and Hammerstein works. Even the sweet musical number “You Were Meant For Me,” fell short without any significant big uptempo bit to bring the show home. I can applaud a couple of really spectacular dance numbers, especially a scene where one intrepid dancer somehow tap dances while on point. The sheer physicality of the act still amazes me. Apart from the song and dance however, we are left with a pretty shallow shell of a plot. Two sisters from the Midwest come to the big city trying to make it big on Broadway. Eddie Kearns (Charles King), a broadway song writer, brings the girls to the city because he fancies Hank (Bessie Love), but he falls for the other sister, Queenie (Anita Page). First of all, not to be that guy but who gives a girl the nickname of Hank? Just saying. Secondly, the melodramatic nature of the simple plot and the overacting were really the nails in the coffin of this mediocre film. Now with that said, I do have to make the concession that this film was just an early example of Hollywood getting its feet in the door with sound films. Also, the fact that not only was this a “talkie”, but it also had to layer dialogue, singing and orchestral accompaniment, shows the early trials and tribulations of sound mixing. It was a nice try by Hollywood to make a sound film work with such new technology, but there is a reason that people do not talk about The Broadway Melody anymore. Check it out if you feel like it, I guess.